After re-reading my last post (something you should probably do before you hit the “publish” button), it occurred to me that I got a little to carried away with the heavy, technical nitty gritty of type 1 diabetes that I didn’t really explain the title of the post very well. And thus was born…..Lesson #1, Part 2. When I said that type 1 diabetes had nothing to do with sugar, that was kind of not true. 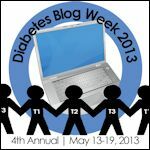 Clearly if you actually read the post, you would know that I talked a lot about sugar and type 1. So I left out a few words, sue me. What I meant to say was, getting type 1 has nothing to do with eating too much sugar. To recap our lesson from yesterday boys and girls, type 1 diabetes happens when your body doesn’t produce insulin anymore and insulin is the hormone that carries sugar from your blood to your cells (not just sugar from sweets, remember carbohydrates turn into sugar–and don’t think you can fool diabetes by not eating any sugar or carbohydrates because your body needs carbs for fuel–remember? If your body doesn’t have carbs for fuel it will burn fat and then you will get ketones–toxic acids– and then you will go into DKA…..is any of this ringing a bell?) And this happens when your body decides to attack itself (autoimmune response) because you are genetically predisposed to this. *An interesting side note here….there is a blood test that will tell you if you have the antibodies specific to type 1 present in your body. If you do, you either already have, or are likely to develop, type 1 diabetes. Hmmmm, should you get tested???? I suppose you could if you really wanted, but if you don’t have someone in your family who has it then you are probably at low risk. But what if you do have someone in your family who has it, say for example, your son, and you have 2 other children…. (enter foreboding music)? The answer to that question is for another post. It will be called, “To Test For Antibodies, or Not to Test For Antibodies, That Is The Question”. (See, I’ve got you hooked now, it’s killing you not knowing when that post will be published (enter evil laugh). But back to this post….. So, what I am trying to say here (I get sidetracked easily) is this; Medium, (or anyone with type 1 diabetes) did not give himself diabetes by eating too much sugar (he did give himself dental carries and the occasional tummy ache and his mother the occasional headache from all the begging and whining) from eating too much sugar, but NOTHING he did or ate caused this to happen. To keep it simple stupid, it was a naughty immune system and crappy luck that caused Medium to develop diabetes.